Find out everything you need to know on the new Nissan Navara from independent vehicle review website Car And Driving. You can watch the video review to the left to see more of the car or read their written review below to get a true insight from an expert in the automotive industry. The Navara has long been a key player for Nissan in the popular pick-up sector, especially since the second generation truck debuted in 2004. Time has moved on however and with renewed competition from the likes of Mitsubishi and Ford, it was time for a major overhaul. This NP300 Navara model is the result. 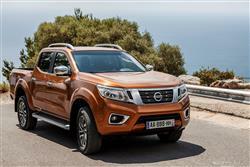 Nissan are promising that in NP300 model form, the Navara pick-up will offer significantly improved refinement and performance whilst remaining a dependable workhorse. More efficient engines, suppler suspension and a greater sense of style promise to appeal to commercial and private buyers alike. Add in reduced emissions and it seems Nissan are in with a shout of class leadership.